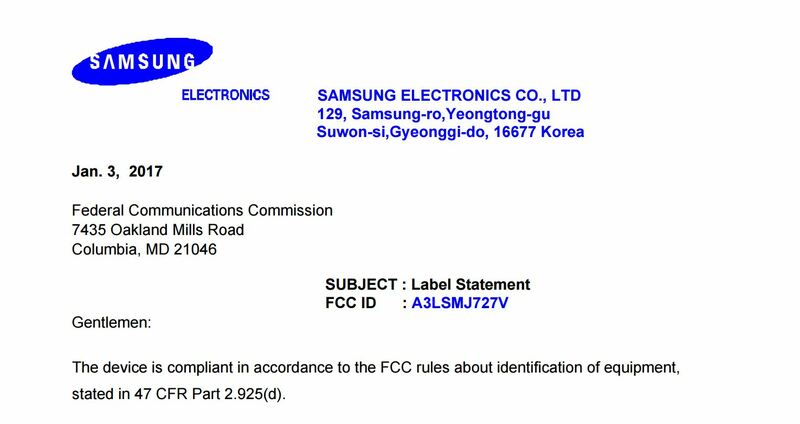 Earlier today, an unannounced Galaxy-branded smartphone was spotted at the United States of America’s official certification authority, the FCC. Unfortunately, the documentation accompanying the device doesn’t reveal anything about its internals, other than it carries the model number SM-J727, which leads us to believe that we’re looking at the long-rumored Galaxy J7 (2017). Recent rumors and speculation point towards the Galaxy J7 (2017) packing a 5.5-inch Full HD display, a 2.2Ghz octa-core Qualcomm processor, 2GB of RAM, a 13MP rear-facing camera, a 5MP front-facing shooter and a 3,000mAh removable battery. It’s also expected to sport a fingerprint scanner, and ship running Android 7.0 Nougat skinned with the latest version of Samsung Experience. If you’ve been following SamMobile closely for the past few of months, you’re probably aware that the handset has already been imported into India for testing, been granted its Bluetooth and Wi-Fi certification credentials and recently surfaced in a prematurely published case render, which means that it’s now passed all of the tests required before it can launch on the open market.